(Left to right): Peter Grace, sr. VP, sales, Clean Energy; Jeff Sheffield, executive director, North Florida TPO; City Council Member Garrett L. Dennis, District 9; City Council Member Jim Love, District 14; Nathaniel P. Ford Sr., CEO, Jacksonville Transportation Authority; Scott L. McCaleb, Chairman, JTA Board of Directors; Air Jolly, JTA Board of Directors; and Isaiah Rumlin, vice chairman, JTA Board of Directors. 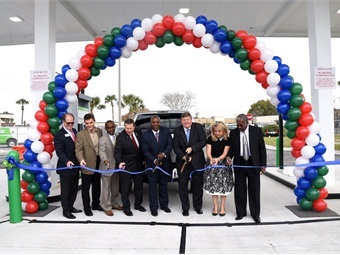 The Jacksonville Transportation Authority (JTA) and Clean Energy Fuels celebrated the opening of the public-access compressed natural gas (CNG) fueling facility at JTA’s Myrtle Avenue operations campus. The CNG project was made possible through a Public-Private Partnership (P3) with Clean Energy. This station, adjacent to the existing, private JTA-dedicated CNG station, will provide access to fueling for both public and private vehicles. The ceremony included a ribbon cutting and fueling demonstration. 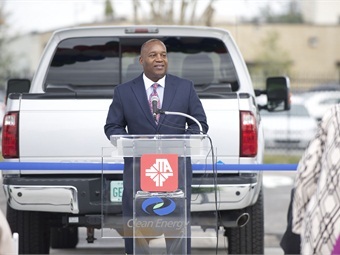 The event included JTA Chairman Scott L. McCaleb, JTA CEO Nathaniel P. Ford Sr. and Clean Energy Sr. VP Peter Grace. JTA’s goal is to have a fleet of 100 CNG buses over four years and we are well underway with 23 vehicles currently in the fleet. Related: 5 Questions with Nathaniel P. Ford Sr. The Clean Energy station is easily accessible for heavy-duty fleet trucks and passenger vehicles. The new CNG station will be open 24 hours a day, seven days a week and uses a public access card reader system. The station includes one single hose dispenser, with the capability of adding an additional three dispensers.